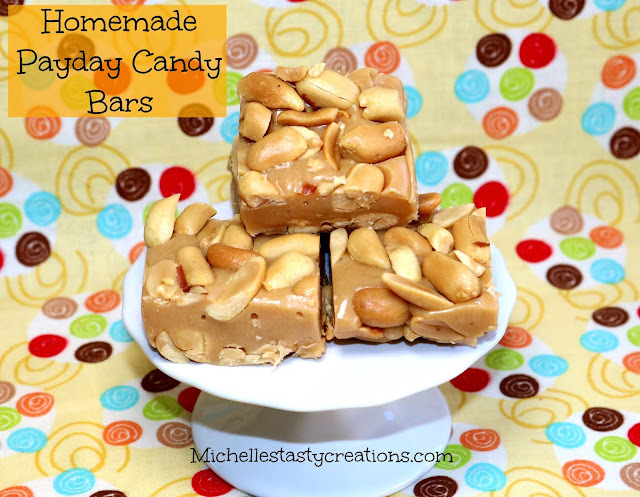 My husband and son love Payday Candy bars and so I thought I would give it a try and make some at home. They turned out pretty tasty if I do say so myself. I always thought making candy would take a long time or be hard to do but it is surprisingly easy and doesn't take any time at all. Line a 9 x 13 or 11 x 7 with parchment paper, pour half the peanuts into the pan and set aside. In a large stock pot melt the butter with the peanut butter chips, stirring often until melted. Add the sweetened condensed milk and stir to combine. Add the mini marshmallows and stir until melted. This takes a few minutes. Pour the mixture over the peanuts making sure to get into all the corners. Pour the rest of the peanuts over the warm mixture pressing them into the filling. Refrigerate for 1 hour or until set. I used to eat these! In another lifetime. I ate all the peanuts and then the center. Memories! Thank you for your comment. I enjoy reading each and every one. I will try to respond in a timely manner so please make sure you have an email linked to your account. All photos on this site belong to me unless otherwise noted and may only be used on another site if prior permission is obtained.